Magical moments at Ben’s Place - The Resident Community News Group, Inc. | The Resident Community News Group, Inc.
Ben’s Place on San Juan Avenue is a haven of fun for folks with developmental, physical and emotional disabilities who enjoy art classes, dances, games, socializing, cooking and just hanging out with friends. 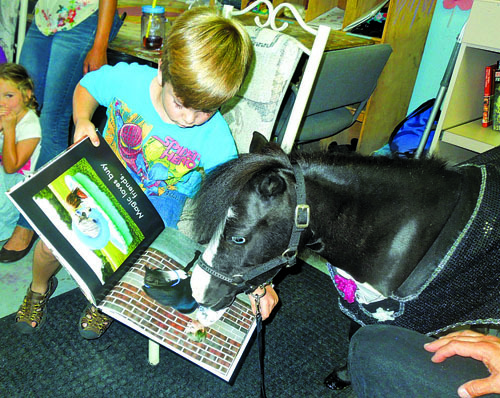 Recently a resounding chorus of “ooohhhs” and “”ahhhs” reflected the delight on the faces of all who met a goodwill ambassador from Gentle Carousel Miniature Therapy Horses appropriately named Magic. Magic’s reputation is huge but her body is so tiny she wouldn’t come up to Black Beauty’s knee. Selected by Time Magazine as one of history’s Most Heroic Animals, named AARP’s Most Heroic Pet in America and featured in Reader’s Digest/ American Towns “Power of a Hero”, Magic quietly goes about the business of making moments magical for anyone she visits – whether comforting a sick child or an elderly patient; visiting with someone in hospice or offering solace to a victim of abuse, her calm, sweet nature brings a sense of peace and comfort. She does what she does best – bring joy into the lives of those who need it most. 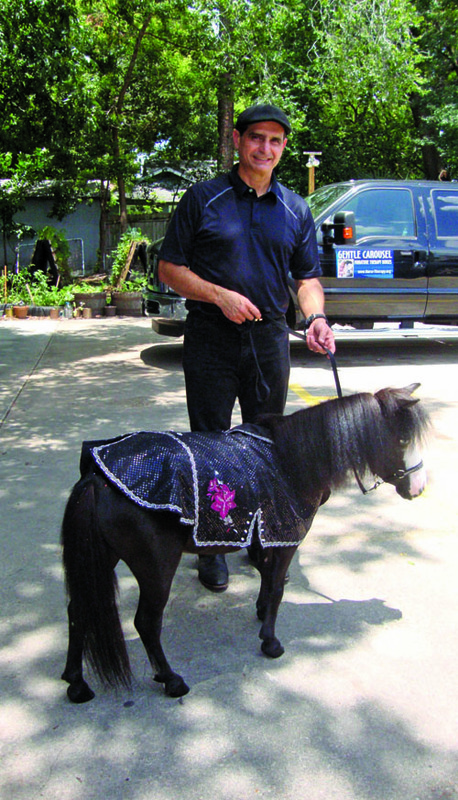 Debbie Garcia-Bengochea and husband Jorge work with Magic and other miniature horses at the Oaks Equestrian Center in Lake City, Florida; they travel all over the United States to visit libraries, hospitals, (Magic has a very special relationship with children in hospital care) or victims of natural disasters. Debbie explained that they were contacted to visit Sandy Hook Elementary School in Connecticut after the brutal killings which occurred there in 2012. The coordinator told her that he had no idea how many people would show up – anywhere from two to 100. There were 600 people in attendance! It was the first time the children had been back together since the disaster. There were a lot of tears from everyone involved – children, parents, teachers, first responders and Magic’s handlers. With her sparkly outfits, and startling blue eyes, Magic is a star wherever she goes. The horses from Gentle Carousel train for about two years before becoming therapy horses. They can navigate various types of floor coverings, ride in elevators, walk up stairs, are comfortable around hospital equipment, crowds and are house trained. Garcia-Bengochea says that they are often asked to visit survivors of catastrophes. After a visit to the Ronald McDonald house in San Marco, the Garcia-Bengocheas and their horses were leaving for Kentucky and Tennessee for a two-week round of visits to spread their magic around. Do you believe in Magic? 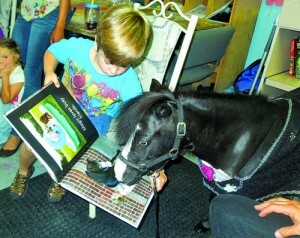 Both Ben’s Place and Gentle Carousel Miniature Therapy Horses are nonprofit organizations run entirely by volunteers. Now that is magical.